Heroic armored warhorse carries He-man to victory! This figure was nearly stacticon before stacticon. Stridor had role in minicomic (Clash of arms) in classic toon (Origin of Sorceress) and in London comic magazines (several minor roles). I promised to add list of previous challenges somewhere in this thread and I will made it. Hopefully to same post where I add my Stridor. Cool, Stridor has great visual potential! Here's some pages that might be worthy to book-mark for reference. Can't seem to find Stridors art there tho..
No big changes. I like 80-version much enought. but there's handy box for weapons in back. And here cames list of challenges #1-72 (listed alphabetically so it's easier to check). Every character has mantion where this name is coming from too, where f mean filmation-based characters. is there anywhere a link, where i can see ALL of these redesign challengers? Sadly no direct link. But use search option in toolbar. With keyword "challenge" in name of topic you can still find all challenges from #21 to present. There are lot of pictures available, but not all. Your rendition is wonderful, though I hope someone else tries to tackle this challenge as well! "I am convinced that the only people worthy of consideration in this world are the unusual ones. For the common folks are like the leaves of a tree, and live and die unnoticed." -The Scarecrow, The Marvelous Land of Oz. Not only does it apply nicely to Masters, but is probably a deep truth. Are we doing a PoP girl next? osgood: you hit near. It is a girl. Monikasvo: great stridor, man! i love the modified helmet and the extra red armor on the neck. the added detailing on the seatback etc. are a nice touch as well. but the best part is the junk in the trunk! any chance you'll do a new version of nightstalker too? working on my stridor... will post him soon! Great pic indeed Monikasvo, I like the big axe on the side and the laser canon at shoulder height. The way you render the tech is also very remisnicent of the old toys sticker, much fitting! Well, as for me I’m a long time lurker of the challenge and finally decided to participate (read took the time to). 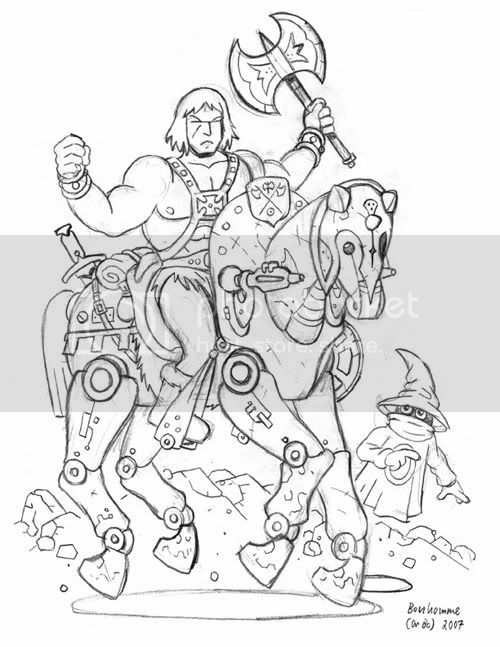 So here me He-Man on Stridor! Just like Monikasvo I really like the original toys and so I didn’t went berserk on redesign. I mainly simplified the legs and the canopy. As I liked the warhorse aspect and wanted to play on that concept, making it a big barbarian steed. I thus added the fur cover, leather straps and weapons. Enjoy! I didn't have time to ink and put color on it, i'll try to do it before the end of the contest! Last edited by Dr Bo; February 22, 2007 at 11:55am. YAY more love for Stridor! Indeed I just drawn He-Man and Orko my way, but didn't change them from the 1980's version per say. As for Stridor it is a redesign, although in line with the original ones. I made the leg simplier, more bulky and less mechancic in overall shape, changed the face a bit, removed the tail gun, moved the shield on top of the neck (it was a crest on both side of the original), covered the ear, changed the gun mount and added straps and a sheet of fur under the saddle. The saddle is the biggest change: on the original figure the leg of the riders would be hidden in the cockpit like trunk. Man of Kitsch, Robot and Glamour. And some barbarians hero, too. Member with whom I completed great trade and transaction: Lady Angora, Royalbliss, 10incher, Secret_defender, Bosskmr, LupaLuna, Motu2002, Buzz Saw Hordak, Malakai9999, Racer X, Igorr & Cpuwizshot. Dr Bo: great cartoony take on stridor! and i really dig the he-man and orko too! A gold star for anyone who gets the non-MOTU "Equestris" reference without looking it up. Last edited by bootleg; February 26, 2007 at 03:11pm. I have missed the last several Challenges by a couple of days, so I wanted to make sure I made this one. Just barely coming in under the wire here..
Not much of an update. 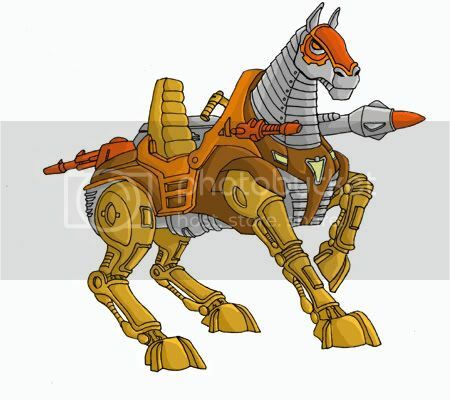 Stridor was a great design. I added the huge cannon from Samurai Battle cat, just to mix it up. BOOTLEG!!!!!!!!!!!!!! I love it! Dr. Omega I'm really liking yours as well... actually everyones is quite great! Right now I'm really liking Stridor standing up. Nice works people! Stridor as a robotic human form? AWSOME! Put up the poll so I can vote already. I think ALL the VEHICLES should be done in human form NOW THERE'S A REDESIGN CHALLENGE! smanomega: do you mean with Monstroid something like this? Beautiful Stridors! I like the shield in front like in DR Bo's version, bootlegs concept and art are awesome and dr. O's version is so dynamic! I will made the poll after about 12 hours. Love that idea Monikasvo!!!!!! Can I chibi him? I might class it as a fan character as he is more of a vehicle...but its so cool to not pass up!!! Dr. Omega: excellent work-- i especially like the gear motif around stridor's eye! Patreek: ... thanks man, i appreciate it! smanomega: i like the way you think--this was something that i eventually wanted to try on more MOTU creatures/vehicles. the creatures are pretty straightforward to envision, but vehicles require a bit more work... actually road ripper is the one i was looking at the other day--for most of these i'm thinking of a transformer-like approach. super-munkyboy: thanks! you're right on about the bravestar thing--that was a big part of my "inspiration." okay, i admit it, it was kind of a swipe. as for nightstalker i was thinking more along the lines of tri-klops stealing the blueprints for stridor and creating his own version, but i like your idea of a rogue stridor too! Monikasvo: thank you so much for the compliment, but enough about me... that monstroid is amazing! i want to see more MOTU vehicle-men from you! the transparent effect you did on his chest is awesome. do you envision him as being human-height or much larger? Awesome work bootleg! You're Stridor is the cat's meow! Excellent colouring too! All times are GMT -4. The time now is 03:07pm.